A Japanese establishment that has managed to survive in filter-kaapi land for over a decade definitely deserves a dekko, especially for poor us who had to settle for the ubiquitous Saravana Bhavan (miniscule helpings with decimally challenging prices - mini coffee for Rs 10.45!!) almost every time we dared to venture out in the Chennai heat. We did spend some time trying to locate the restaurant, hidden as it is in a nook of an old building (which led me to wonder if all Japanese restaurants are housed this way - check our review of Harima). The neat interiors are done up sparsely with Japanese lanterns, a shelf full of Japanese DVDs and books (for rent, I presumed), a small TV tuned into a Japanese channel, traditional Japanese seating as well as conventional tables and chairs. We were given cold towels and refreshing chilled wheat tea (ocha in Japanese) upon arrival. Perfect to go with the icy hostess and co-owner, Revathi who was reticent, almost to the extent of being rude to us throughout our meal. We did notice that she seemed courteous to the Japanese patrons present there though. Hmphf!!! Being cold shouldered by the hostess, we had no option but to take menu suggestions from a kind looking Japanese gentleman who was seated at the next table, Mr. Toshi. He was not only good company; he also recommended some pretty interesting Japanese staples and accompaniments which we enjoyed. Japanese food is supposed to taste natural with almost no spice added. Soya sauce, ginger, wasabi, seaweed etc are used on the side to add some flavour during meals. 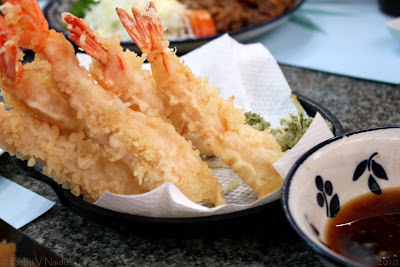 We started off with simple and crisp Ebi Tempura (batter fried prawn) with a soya sauce dipping. Dahlia has an impressive variety of fish and other seafood on its menu so an order of mixed maki sushi made its way to our table. 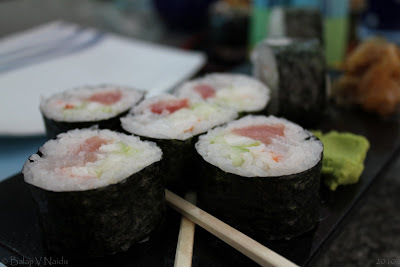 The fish was extremely fresh and the sushi rolls get top rating for their subtle flavour. We enjoyed it so much that we almost didn't realize that the fish was raw....not something we get to eat everyday ;) Not to forget a rehash of the mind-numbing wasabi experience! Next was the Teishoku or the Japanese set meal which is a portion of rice, miso soup, pickled vegetables and a vegetable or meat dish- in our case, roasted pork with ginger. The pork is spooned over the rice (the accomplished ones use chopsticks!) and eaten, with a bit of the accompaniments in between. 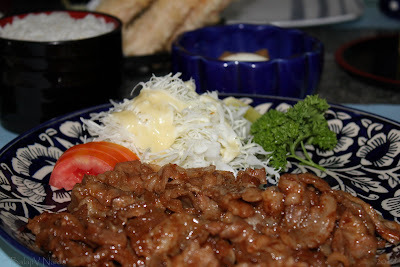 The tender strips of pork, mildly sweet and cooked to perfection were outrageously tasty. The miso soup tasted watered down but we were told by our Japanese friend that it is how it should be. To quote Lonely Planet, it’s hard to imagine how Tokyo could function without noodles. 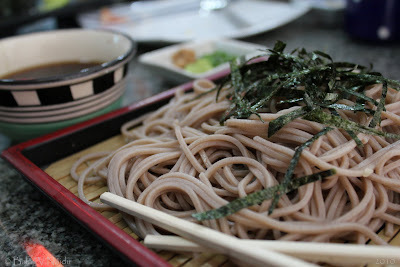 Fittingly, the menu at Dahlia offers staples such as soba (brown buckwheat noodles) and udon (white wheat noodles) served hot or cold, in a range of styles. Our serving of Zaru soba (cold noodles) came in a bamboo plate with slivers of seaweed on top, along with some broth, wasabi and chopped spring onions. The wasabi and spring onions are mixed a little at a time in the broth, the noodles are then dipped into it and eaten. Despite not being richly flavoured, the dish was very satisfying. There are no desserts on Dahlia's menu but what we had was filling enough. The portions are good enough for two and the flavours are appetising without leaving an aftertaste for the rest of the day (which means no going burrrrp and smelling of onions or fried chicken later :D). 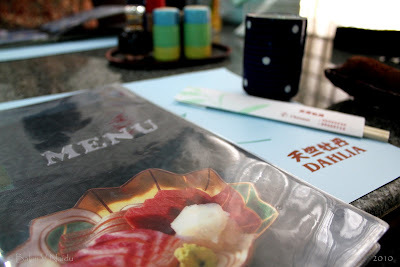 Revathis ill-mannered behaviour (seems to be a common sore point across many reviews we came across) would have dampened our experience if not for Mr Toshi who helped us pick from the menu as well as surprised us with useful nuggets of information on Japan and its food. Thank you for letting us know that our babys name means 'happiness' in Japanese!!! Yes, we have a daughter, A DAUGHTER, WORLD! Edited to add: Dahlia has a branch in Bangalore as well. Church Street is the place to go if you are craving some Japanese chow. ...............................that maki means 'roll' and refers to any type of sushi which is made in a roll with sushi rice, toasted seaweed and various fillings? ...............................that although it’s highly rude in the West, in Japan it is customary to slurp your noodles, both to cool them (when hot) and to enhance the flavour? 2 READERS CLICKED HERE TO COMMENT ON THIS POST. ADD YOUR COMMENT! Thank you for this update. 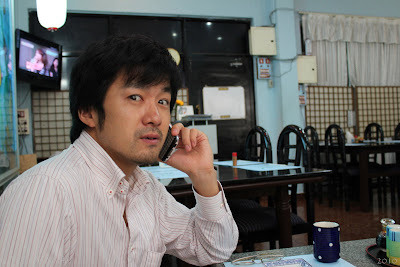 i keep reading your blog and enjoy it a lot. I am a foodie too. 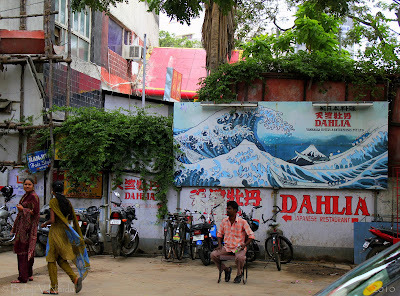 Will try this restaurant when i am in Chennai. I am a great fan of japanese cuisine, having tasted various delicacies during my trips to Japan. One imp. difference, according to me, which makes japanese food more palatable and tastier than the mainland Chinese food is the decoration and style with which the food is served.